Always buy eggs from a refrigerated case. Choose eggs with clean, uncracked shells. 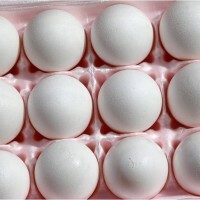 Buy eggs before the “Sell-By” or “EXP” (expiration) date on the carton. Take eggs straight home from the grocery store and refrigerate them right away. Check to be sure your refrigerator is set at 40°F or below. Don’t take eggs out of the carton to put them in the refrigerator — the carton protects them. Keep the eggs in the coldest part of the refrigerator — not on the door. Always wash your hands with warm water and soap before and after handling raw eggs. To avoid cross-contamination, you should also wash forks, knives, spoons and all counters and other surfaces that touch the eggs with hot water and soap. Don’t keep raw or cooked eggs out of the refrigerator more than two hours. Egg dishes such as deviled eggs or egg salad should be used within 3 to 4 days. If you have a question about meat, poultry or egg products, call the USDA Meat and Poultry Hotline toll free at 1-888-MPHotline 1-888-MPHotline or 1-888-674-6854 1-888-674-6854 , TTY: 1-800-256-7072 1-800-256-7072.